I've made this recipe before but in cupcake form. It totally rocked my world and these whoopie pies do not disappoint. I basically took the cupcake recipe and added some flour and baking powder. I think they turned out pretty well. Preheat oven to 350. Lightly grease baking sheets or line with parchment paper or a silicon baking sheet or if you have a whoopie pie pan, like I do, spray each well with pan release such as Pam. In a large mixing bowl, combine the flour, sugar, baking soda, baking powder and salt. In the bowl of an electric mixer fitted with the paddle attachment, beat together the eggs and sour cream to blend. Add the stout-butter mixture and beat just to combine. Mix in the dry ingredients on low speed just until incorporated. Using an ice cream scoop or large spoon, drop dough onto prepared baking sheets and bake for 7-9 minutes. Let cookies sit for 3-5 minutes on baking sheet then transfer to wire rack for cooling. Once cooled, take the Irish buttercream filling and make sandwiches with the cookies. To make the filling, place the butter in the bowl of a stand mixer fitted with the paddle attachment. Beat on medium-high speed until light and fluffy, about 2-3 minutes. Gradually add the powdered sugar until it is all incorporated. Mix in the Bailey’s until smooth. Add more if necessary until the buttercream has reached a good consistency for piping or spreading. If the consistency of the buttercream is still not spreadable and you are worried about adding too much Bailey's, you can add a teaspoon or so of milk (not too much) to get it to spreadable consistency. Holy cannoli, these are awesome! I just finished inhaling one and the balance of the not-too-sweet cake with the buttercream is perfect. There's a very subtle aftertaste of the Guinness in the cake and it's a win win with the Bailey's buttercream. Um, please ma'am, may I have another? p.s. I love that you have an alcohol category...tee hee. I have made alot of whoopie pies without using a molded pan with great success. This recipe just did not workout for me however. The pies flattened out in the oven almost immediately, and came out looking like chocolate cookies. Did I do something wrong??? Good recipe! I liked the buttercream filling instead of the marshmallow cream filling...I'm not big fan of marshmallow cream myself. Also, in your recipe did you use dutch process cocoa or cocoa rouge? I used cocoa rouge with great results. I've tried a few different recipes for chocolate cake that had Guinness in them and most of the time you can't really taste the beer, but in your recipe the Guinness sings! Overall, a top notch recipe. 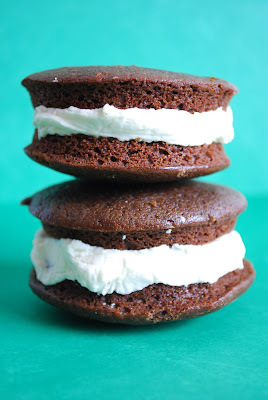 I made these for St. Patty's day, and after some MAJOR troubleshooting, they turned out great...if you are going to give a recipe with directions for use with and without a whoopie pie pan (made it without), then you should probs try making them both ways, b/c your portion size for the cakes are so off! you need to give a specific size for the ice cream scoop, b/c I used an old normal one and they all ran together....so i figured out use a 1/4 to 1/3 of a "normal" size ice cream scoop onto a parchment lined pan and they'll be a proper size.